One the most popular appetizers out there and now the cutest little creations are these delicious little pigs in a blanket. These are just perfect for a baby shower. Here is just a quick idea to add to that future bundle of joys baby shower that will be the easiest of all appetizers to make and everyone got the idea when they saw them. Of course you can just wrap them anyway you want to whatever theme it may be to be creative like halloween for mummies, football shapes etc. After you cut the hotdogs to fit the 40 pieces. Take a piece of dough and using the palm of your hand press down to form a circle. Place the small bite size piece of hotdog in the center with part of the top over the top of the dough showing. 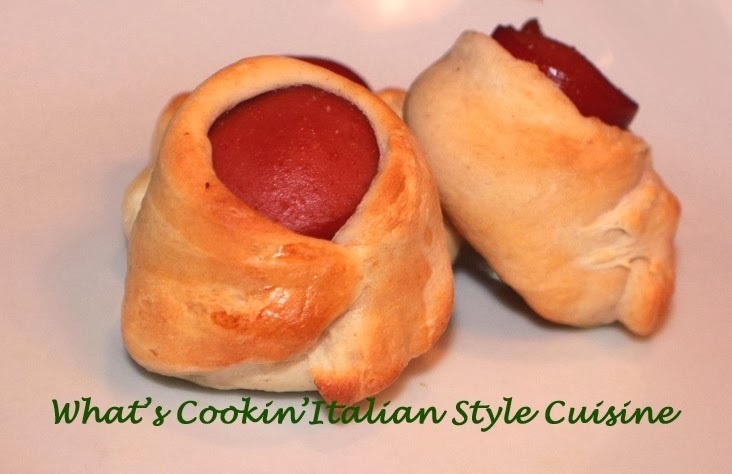 Fold the bottom (which is the center of the dough) up the middle of the hotdog bite, then one side at the time to meet in the middle forming how you would put on a diaper. Brush with eggs whites or egg yolks beaten on top to seal. Bake in preheated oven on 400 degrees until browned around 10 minutes.